It's a full moon tonight and the wolves are out in full force in another modern IGT slots machine, Wolf Rising! If you have dreamed of what it would be like to be part of a wolf pack, dream no more because in this 5-reel, 8-row, 100-line slot machine you'll join four different wolves in the twilight. It’s a full moon tonight and the wolves are out in full force in another modern IGT slots machine, Wolf Rising! 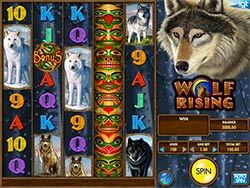 If you have dreamed of what it would be like to be part of a wolf pack, dream no more because in this 5-reel, 8-row, 100-line slot machine you’ll join four different wolves in the twilight. We have a selection of IGT wolf-themed slots on Slotorama like Wolf Run, Wild Wolf and Night of the Wolf. In our opinion however, Wolf Rising has got to be the most beautiful of them all. The illustrated wolves and totems are gorgeous and the increased 8-rows from the standard 3 adds a nice touch of excitement to the game. Bonus Symbol – The bonus symbol is a round medallion with Native American art on it. Getting 3 symbols on the center 3 reels (reels 3, 4 and 5) pay 2x the total bet and awards you with 5 Free Spins! Free Spin Stacked Wilds – Stacked Wild symbols in the Free Spins feature are still the totem symbols however they turn to different hues of purple and blue. They will substitute for all symbols except the bonus symbol.